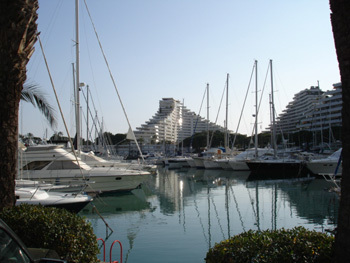 MARINE MANAGEMENT has waterfront offices on the port of Marina Baie des Anges, a port protected by the pyramid shape buildings just along the coast from Antibes. A secure and friendly port, close to the airport for easy access. MARINE MANAGEMENT offers you a really superb Gardiennage service, not only during the summer months but also during the winter. We can either garage your boat or look after it in the water in the winter. We have a very experienced staff and work closely with one of the best mechanics on the Coast, so any problems can be sorted out within a reasonable time span.